Home » Cheap and Good? 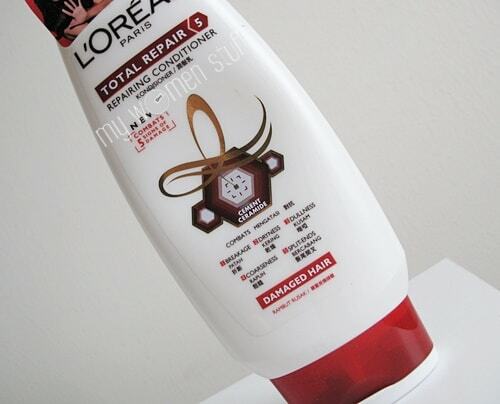 » L’Oreal Total Repair 5 Shampoo and Conditioner – Work that hair! 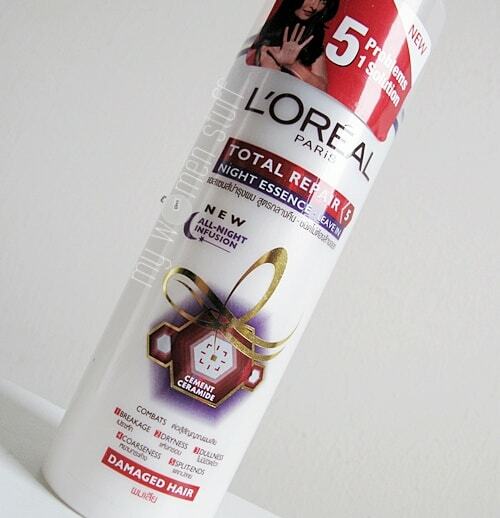 L’Oreal Total Repair 5 Shampoo and Conditioner – Work that hair! I’m very bad at recognizing faces of celebrities so when I saw the L’Oreal Total Repair 5 shampoo and conditioner ad on tv, I was wondering who that spokesperson might be. Turns out, it is Aishwarya Rai – Bollywood queen. Since then, every time I think of the Total Repair 5 line, I think of Aishwarya Rai and her exaggerated sashay in the ad. Look it up on Youtube if you want to know what I mean, or click after the jump for the video. I tried this line at a time when my hair was feeling particularly like straw. (For those who do not know what this means, it means my hair feels dry and stiff like straw i.e. dry grass not drinking straws – yes I’ve had enquiries) and from first wash, I almost felt like I could swish my hair like in a shampoo advertisement! It was smooth, tangle free and soft. So swishable! Only problem is that I have short hair, so no swishing for me. But it was nice. However, I found the effects did not quite last. 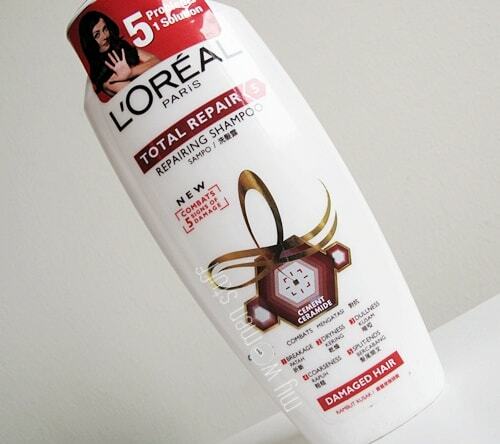 Total Repair 5 aims to address 5 hair problems – breakage, dryness, roughness, dullness and split ends. I have probably 3 out of 5 of the problems so it would be interesting to see how it fared. As I noted above, from first wash using the shampoo and conditioner, my stiff dry hair immediately felt soft and manageable. The shampoo lathers up a treat so for my short hair, I use just a dollop, about the size of a 20 sen coin. The conditioner too works well with just very little so its really very economical. However, I found that even with regular daily use, my hair did not stay soft and swishable everyday. It would feel nice immediately after washing, but once dry, it would feel a little “rough” again. Alright, I thought. Lets give this 2 weeks and see what happens. Well, nothing happens really. Hair feels much much better than straw but still not as wonderful as when you first wash and dry it. I’m not quite sure what to make of it. Using the Total Repair 5 Night Essence doesn’t quite change anything. It helps make the hair feel lovely and soft, and it isn’t sticky. It reminds me of the L’Oreal Elseve Royal Jelly night essence treatment and I’d say it works about the same really. 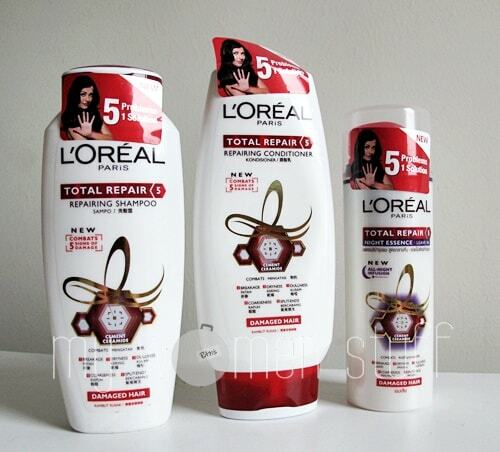 The L’oreal Total Repair 5 line is meant to be more intensive to treat damaged hair and its a step up from the L’Oreal Elseve Re-Nutritive line. As the latter did nothing for my hair (hated the conditioner 😛 ) I must say that Total 5 Repair is an improvement on many levels. All in all, I’d say this is a pretty decent shampoo and conditioner that I might come back to because whilst the swishable factor doesn’t last, my hair isn’t looking any worse for wear and that’s what it comes down to at the end of the day! Also, its affordable and since I wash my hair everyday, that matters too! can anyone tell me which shampoo is most suitable for frizzy and dry hair ? ?